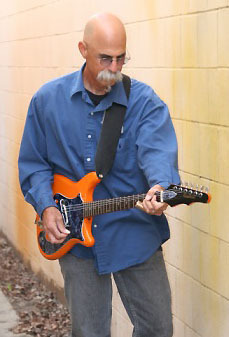 I have been a working (and working class) guitarist for about 40 years now. I’ve played plenty of blues and folk, jazz and rock and roll. I think of my acoustic solo music as “contemporary traditional”; original music that reflects my interest in a number of styles of music. These influences come through in my original material, but it is a contemporary music that grows from, rather than mimics, those influences. When I play someone else’s music or a traditional piece I do my best to give the listener at least a few small surprises. I have written two books on alternate guitar tunings for Centerstream Publications. Recently Centerstream had me do three instructional DVDs; beginning fingerstyle, intermediate fingerstyle and intermediate blues improvisation. Take a look at the STORE page and read all about it. I play guitars built by Michael Baranik. One is cedar and cocobolo, one is spruce and rosewood. The third is a double top with spruce on top and cedar on the inside, cocobolo back and sides. It has an adjustment on the outside of the heel to move the neck angle to change the string height at the turn of an allen wrench. Very convenient. It has a very transparent and punchy sound. I am happy to have it. I play GHS strings. There are Highlander pickups in all of my instruments and I am a big fan of the Highlander DI box. Ron Saul built my uke and we all owe a lot to National Resophonic Guitars (San Luis Obispo) and Renaissance Guitars (Santa Cruz). Did we get everybody? Keleran Millham, a fine singer in Spokane, once said of my music, “There is an integrity and clarity to his work”. I try to live up to that. The integrity thing is easy. The clarity thing is really hard.